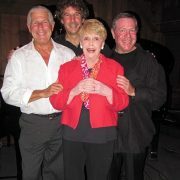 Vocalist Peggy King, 83, will perform in New York City for the first time in decades, along with All-Star Jazz Trio, on Dec. 30. The show will take place at 54 Below, 254 West 54th Street. Show time is 7 p.m. The cover charge is $25-35 and there is a $25 food and beverage minimum. King has worked in films and television with such artists as Frank Sinatra, Mel Torme, Sammy Davis, Jr. and Andre Previn and has released dozens of recordings. The All-Star Jazz Trio consists of pianist Andy Kahn, drummer Bruce Klauber and bassist Bruce Kaminsky. For more information, visit 54 Below.